The event had to be rescheduled from the previous week when a snow storm shut the city down on the appointed Saturday. But the organizers, the St. Andrew's Society of Montreal, made the right call and the weather gods rewarded them with late afternoon sunshine. 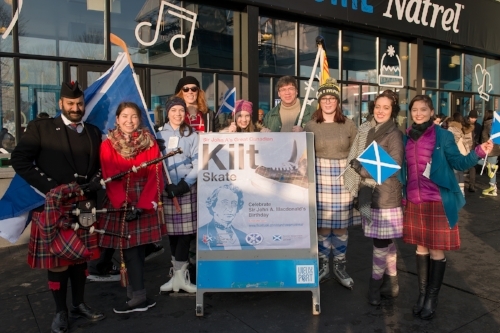 The Scottish Government helped sponsor the event, which enabled the organizers to provide free cake and hot chocolate for everyone, as well as pay the admission price for anyone who came to the Natrel Skating Rink wearing tartan. Brian MacKenzie said he would defy the laws of gravity -- hopefully! Kevin Ross hoisted a Stewart banner on a curling broom. Gillian and Marilyn cut the cake for Sir John A. Macdonald's 203 birthday party. According to Gillian, the cake was soon "demolished" by appreciative (and hungry) skaters -- and here's the photographic evidence! This year, Scotland celebrates its "Year of Young People," and there were certainly lots of young people who came out to enjoy a skate on a Saturday afternoon. Canadian Press was on the scene to record the event on video, as published by the Globe and Mail. The young lady in the photo above makes her observations on what it is like to skate in a kilt. Here's an on-the-ice view of the action. Last year, Montreal won bragging rights as the 2017 Kilt Skate Capital of Canada. Dr. Gillian Leitch reports that, "Everyone said that it was the best one ever, which was lovely to hear." Will Montreal remain this year's Kilt Skate Capital? Other kilt skates are scheduled for Ottawa (January 20), Saskatoon (January 27), Toronto (January 28), Alexandria (February 3), and Calgary (February 11). Montreal has flung the gauntlet with a great event; let's see if the other communities can meet the standard!